Buy your home with confidence knowing that if our 1st Choice Home Inspections inspector misses anything during our inspection, InterNACHI will buy back your home for the full purchase price. That’s right! When you notify 1st Choice Home Inspections that you want to participate in this program you can relax knowing your home is backed by the buy back guarantee. You must let us know in writing, and before closing, that you want to participate in the InterNACHI Buy Back Guarantee program. It is not automatic for every inspection. 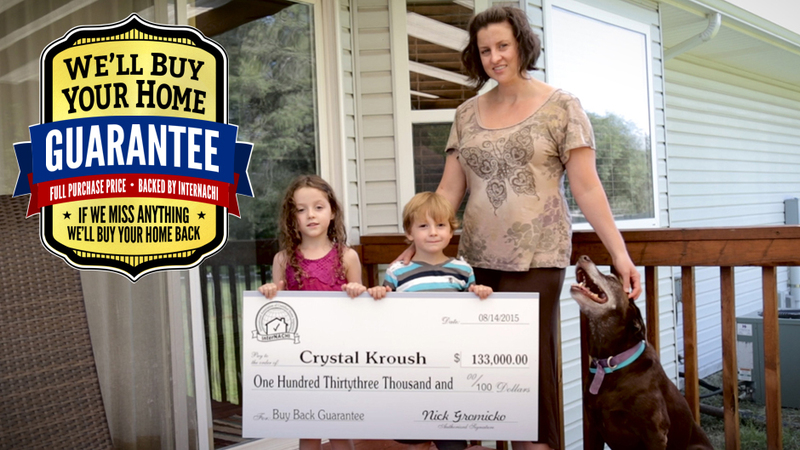 What do you charge clients who want to participate in the InterNACHI Buy Back Guarantee program? Nothing. We do not charge our clients for the program, it is free. But you must request it. How do I enroll in the program? You must tell us in writing, before closing, that you want to participate. So what is the fine print? Honored for 90 days after closing. Valid for home inspections performed for home buyers by participating InterNACHI members. We’ll pay you whatever price you paid for the home. The home must be listed with a licensed real estate agent. Excludes homes with material defects not present at the time of the inspection, or not required to be inspected per InterNACHI’s Residential Standards of Practice.